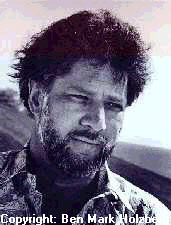 The U.S. publisher's guide to Ondaatje's work, including some background information and an audio excerpt from Anil's Ghost. Caution: The links are currently down. Discussion and background information on Ondaatje's poetry and fiction, mainly from a postcolonial perspective. Part of the Contemporary Postcolonial and Postimperial Literature in English website. Please let me know if the hyperlinks on this page work, since there appears to be a number of very potentially useful essays on them. Eleanor Wachtel's interview with Ondaatje about his recently published new novel in May 2000. From the CBC Infoculture web site. An interview conducted by Dave Weich of Powells.com during Ondaatje's appearance at the Portland Arts & Lectures Series on May 23, 2000. Brick: A Literary Journal Note: New URL! Norman Allan writes that he has a signed portrait of Ondaatje on his site in the "Gallery" first room, south wall. His main site can be accessed by clicking here . Index for The English Patient Note: New URL! Lisa Mirabile, a student working on a Master's degree in Library and Information Science, has posted an index to Ondaatje's novel on the web. She reports that she plans "further enhancements in the future, such as information on the indexing of fiction (a rare and peculiar undertaking!)" Wolf Braun of Two Shoes Communications in Belleville, Ontario reports that Michael's brother, author and financier Christopher Ondaatje, has an official web site. This is a 2 minute 25 second trailer for the 1996 film The English Patient. The file is approximately 5.6 megabytes in size and will take considerable time to download. The television advertisement for the film The English Patient. A 14 second clip. A good place to order U.K. editions of Ondaatje's works. A cursory search revealed three Ondaatje novels in stock--Coming Through Slaughter, In the Skin of a Lion, and (surprise, surprise!) The English Patient. In addition, Blackwell's has Anthony Minghella's screenplay for The English Patient film in stock currently. One of the best web sites I've seen devoted to Ondaatje's novel and Minghella's film--various pages complete with stills and audio files from the Miramax production. A "must see" in my opinion. Thanks to Maryann Mpvisniewski. Visit a new site devoted exclusively to Ondaatje's novel The English Patient and the film it inspired; includes some nice photographs and a couple of newly updated .RA files including the famous "Promise me you won't leave" line. The U.K. Internet Book Shop is offering a special price on Ondaatje's suddenly internationally famous novel. An Ondaatje page under construction with a bibliography and links. Marilyn Jones's review published in Canadian Review of Comparative Literature, March 1995. Random House announces the publication of a new edition of the novel with a tie-in to the film version. I welcome any additional Ondaatje links. Please send them to Thomas B. Friedman. Click on the animated e-mail graphic above.